RotoValue now also shows professional standings for both MLB and NBA. 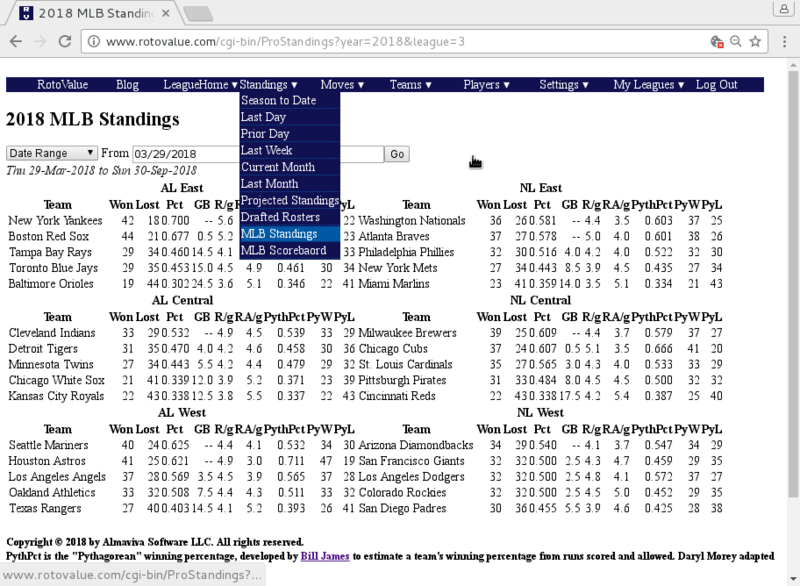 And, like the fantasy standings pages, you can customize them to any date range you like. So if you want to see how your team has done since a particular date, or over the past month, or since they called up Gleyber Torres or Ronald Acuna, RotoValue’s ProStandings page can show you. The Braves were two games behind the Nationals between Acuna’s call-up and his going on the DL on May 28th, while the Yankees have gained 7 games on the Red Sox since Torres was recalled through yesterday, June 9th. Like the rest of RotoValue, this page is advertising-free, but it also adds some data that may be useful to fantasy sports players. In addition to wins, losses, and percentage, the page also shows runs (points for the NBA) scored and allowed per game. It’s a nice quick way to see how teams are doing, and if your pitcher is facing a tough offense next week, or your player is going up against harder defenses. RSX/(RSX + RAX), where X varies depending on the sport. When Bill James first proposed the concept, he used X=2 for MLB, but subsequent research has found a better fit with a somewhat smaller exponent. I’m using 1.83 for MLB, and 13.91 for NBA as proposed by Daryl Morey. Teams whose records are much better (or worse) than their expected records have typically been (un)lucky, and are more likely to revert closer to their expected winning percentage. That can give you insight on which teams may be more (or less) likely to contend for a playoff spot or (often more important for single-league fantasy purposes) trade away talent. In addition to ProStandings, there is also a Scoreboard page, which shows games, and, where appropriate, scores, for a given date. This entry was posted in Major League Baseball, NBA Basketball. Bookmark the permalink.